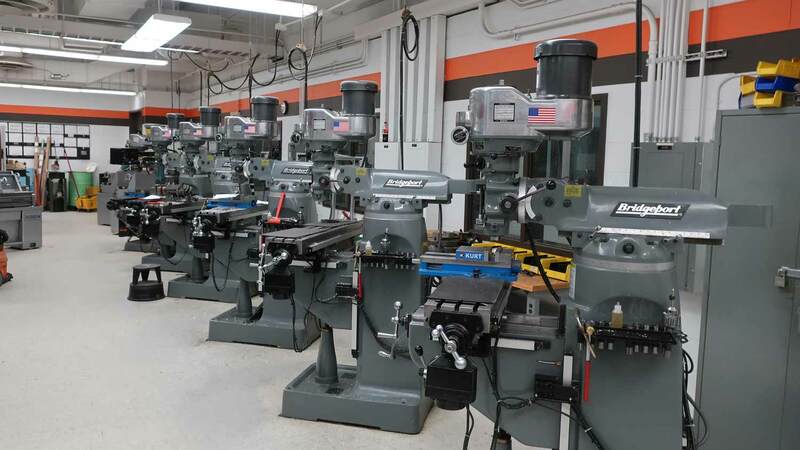 The program is offered by the department of manufacturing and mechanical engineering technology in collaboration with the Saunders College of Business and the Kate Gleason College of Engineering. The program consists of 36 semester credit hours and is comprised of core courses, a three-course concentration, electives, and a capstone project, thesis, or comprehensive exam. Concentrations are available in product design, automation, quality, or electronics manufacturing. Students may be required to take additional prerequisite courses depending on their background and the concentration they select. The graduate director may approve the waiver of courses in the prerequisite group from graduation requirements, depending on a student's academic and employment background. The number of electives is based on whether the student chooses to complete a thesis, capstone project, or comprehensive exam. The thesis option requires one elective; the capstone project requires two electives, and the comprehensive exam option requires three electives. Elective courses can be any course from a different concentration from the one chosen, a graduate-level course from another program (if approved by the graduate director and faculty member teaching the course), or an independent study course (if approved by the student’s graduate program director). Rochester is making an impact in photonics manufacturing, and RIT is playing a role as a key partner in AIM Photonics, a national manufacturing initiative expected to stimulate economic development and global competitiveness. UNA Smart, touted by developers as an innovative way to brew coffee and tea anywhere and anytime and created by five RIT alumni, was recently named to Brazil’s Top 100 startups list. A written comprehensive exam is one of the non-thesis or non-project methodology for completion of the MS-MMSI degree. Students will demonstrate a fundamental knowledge of the theories and foundation principles. This course will require the student to do an independent review of the concepts within the core courses and the chosen concentration area, and will culminate in a comprehensive written examination. The student must receive a passing grade of at least 80 percent to be successful. Students will have one additional opportunity to pass the exam, if their initial attempt results in a failing grade. Computer-based simulation of dynamic and stochastic systems. Simulation modeling and analysis methods are the focus of this course. A high-level simulation language such as Simio, ARENA, etc., will be used to model systems and examine system performance. Model validation, design of simulation experiments, and random number generation will be introduced. This course will provide a thorough understanding of the manufacturing automation principles, practices and system integration. Topics include a thorough coverage of the automation hardware and software, essentials of digital and analog control using Programmable Logic Controllers (PLCs), industry best practices for programming PLCs and the essentials of Human Machine Interface (HMI) for data entry, manipulation and recording system status. Technology and application of robots and CNC in an integrated manufacturing environment is the focus of this course. An introductory understanding of robotic hardware and software will be provided. The hardware portion of this course involves robot configurations, drive mechanisms, power systems (hydraulic, pneumatic and servo actuators), end-effectors, sensors and control systems. The software portion of this course involves the various methods of textual and lead through programming. Digital interfacing of robots with components such as programmable logic controllers, computer-controlled machines, conveyors, and numerical control will be introduced. Robotic cell design and the socio-economic impact of robotics will also be discussed. This course also has a strong laboratory component that emphasizes hands-on training. This course provides a thorough understanding of the technology, components, equipment, design and manufacturing process for surface mount electronics manufacturing. Students will develop a strong foundation needed for advanced work in surface mount technology (SMT). The laboratory activities will provide the students an orientation and familiarization of the manufacturing equipment and process parameters for printed circuit board assembly. This advanced course in electronics packaging will provide a thorough coverage of the materials, processes, failure and reliability of chip level and PCB level packaging. Specific topics include single-chip, multi-chip, wafer level and 3D stacked packaging, smaller passives and embedded passive component technology, advanced substrates and microvia technology, solder technologies, metallurgy and joint formation, thermal management, thermal and mechanical behavior of packaging, failure analysis, and reliability testing. This course focuses on critical parameter management (CPM) as defined within the Design for Six Sigma framework. CPM tools and techniques include translating the voice of the customer into technical requirements, defining functions to fulfill the requirements, generating designs to physically fulfill the functions, data acquisition and analysis, and the evaluation and selection of superior product and subsystem designs that are safe to take to commercialization. Students are introduced to CPM best practices through case studies and hands-on projects. This course covers topics, processes and best practices in product development. Using Design for Six Sigma (DFSS) as a motivating philosophy, students are introduced to concepts and techniques in the early stages of the product development process, including capturing the voice of the customer, critical parameter management, the phase-gate approach, and system integration for total product life cycle performance. The course provides an overview of DFSS goals, its development process, CDOV (Concept-Design-Optimize-Verify), and technology process (IDOV, Innovate-Develop-Optimize-Verify), as well as strategies in product commercialization. Hold a baccalaureate degree (or equivalent) from an accredited university or college in the field of engineering, engineering technology, or computing. Students with degrees in other disciplines will be considered on an individual basis. Have completed college level course work in computer programming and probability and statistics. Have a minimum cumulative GPA of 3.0 (or equivalent). Applicants with a lower GPA will be evaluated on a case-by-case basis and may be admitted on a probationary basis. These students will have to secure a B or better average in the first three graduate courses to be considered for full admission.